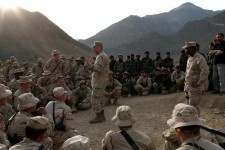 CAMP BLESSING, Afghanistan – The 33rd Commandant of the Marine Corps and the Sergeant Major of the Marine Corps visited the Marines and Sailors of 3rd Battalion, 3rd Marines Regiment operating in support of Operation Enduring Freedom just before Christmas. Gen. Michael Hagee and Sgt. 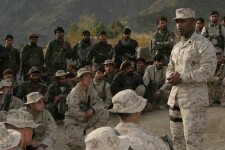 Maj. John Estrada congratulated the troops for their dedication to duty at the forward edge of the battle area. Estrada echoed the sentiments of the commandant and assured the troops that they were making a difference by being in the fight. “Stay vigilant. 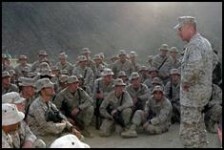 You’re doing important things here and you must always remember that you are a Marine,’ said Estrada. 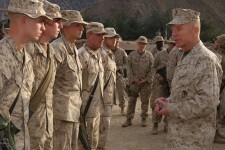 The senior enlisted man and the commandant then took questions from the gathered Marines and Sailors who were eager to ask about future deployments, even as they were still in the first few months of their current deployment. After answering the Marines’ questions and passing out coins, the heads of the Marine Corps took time to take pictures with all of the Marines.